In 2010, at the age of 60, due to a blood flow disorder, Dave lost the majority of his vision over a 3 day period. With the loss of vision, unemployment became a reality and with the resulting loss of income, marital status, and a social network, life became a challenge. While walking with a white cane, a former member approached and invited Dave to join the sight impaired group at the Nanaimo Lawn Bowling Club. The lawn bowling community has provided a conduit for new friendships and a physical activity essential to a healthy lifestyle. Club members have embraced Dave’s dedication and contribution to the sport of lawn bowls. They consistently include him in regular tournaments for the sighted. Through 2011 – 2014 Dave has steadily improved as a lawn bowler with victories and top three finishes both in sight impaired and fully sighted bowling. 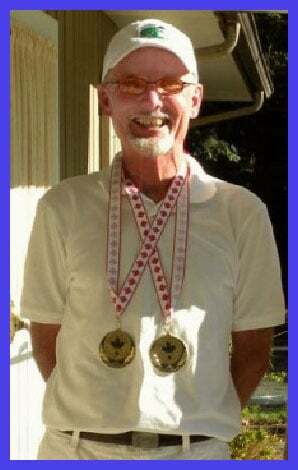 Together with two sighted bowlers, he won the 2014 Tenderfoot Tournament in Parksville. This is a tournament for bowlers with 3 years or less experience and involved teams from all over the north island. At the 2014 Provincial Championships for Sight Impaired, Dave went undefeated for a gold medal win and earned qualification to the National Championship in Brantford, ON. At the National Championship, he lost only one game in the singles competition and won all his games in doubles to win two gold medals. He is the current National Champion for his B2 Division. As a qualified sight-impaired representative for the City of Nanaimo, Provincial Champion, and a National Gold Medalist, the International Bowls for the Disabled World Championships to be held in Wellington, NZ February 2015, is an opportunity of a lifetime and a dream come true.